Automated Running Logs – GPS or Footpod? 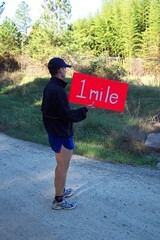 Although I’ve been a runner for over 15 years now, I must admit that I only kept a running log for less than 4 of them. Before I had a running watch that saved more than a single run, I had no problem keeping a log – it was an ingrained habit. As soon as I got a watch that kept 100 runs, I would put off transferring them to my log until the watch was full. By that time there was no way I was going to be able to remember where I ran or what I did each day. These watches were my running log downfall. I gave into laziness and besides, who has time to maintain a running log? It seems like a luxury to have the time to do that. What I needed was an automated way to keep a log using a computer. My requirements were simple. I needed a watch that could transfer its runs to a computer, preferably in an automated way. I also needed a watch that would track the distance and speed of my runs. There are basically 2 types of watches that fulfilled these requirements. The Garmin Forerunner line of watches uses GPS to track where you’ve run. These watches were coming down in price, so it seemed like a good time to put it through the paces. There are other watches that use a “footpod” – a small battery powered device that you attach to the laces on your shoe. It uses an accelerometer to take samples at about 100 times a second and transfers them to the watch which displays pace, distance, etc. I took two such devices through the paces (so to speak) to see which one would take me to the running log utopia that I sought. This entry was posted in Everything, Running on February 1, 2006 by Dave. Remember when the Mach3 came out? 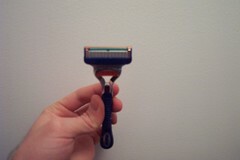 Three blades on a razor – who would ever need that? Aren’t 2 blades good enough? Well, the new Fusion has 6 blades. That’s right, 6 blades. There are 5 on the face of the blade and an extra “precision blade” on the top for those “difficult to reach areas”. Would there even be a need for this extra precision blade if there weren’t 5 blades on the face? Those 5 blades require scaffolding to support it – no wonder you can reach every place on your face. 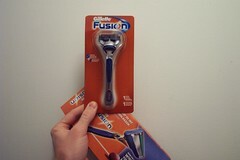 Do we really need 5 blades on a razor to get a close shave? Instead of trying to get more and more blades on the face of a razor and spending millions to market the “more blades is better” concept, why doesn’t the industry invest in creating a blade that doesn’t go dull? I think we all know the answer. Not only are they investing big bucks in figuring out ways to get more blades on a razor, but they’re trying to put a computer in it. 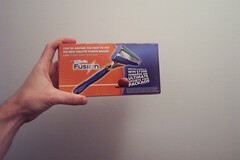 There’s another version of the Gillette Fusion called the Gillette Fusion Power that not only has 6 blades, but contains a microchip and requires batteries. A microchip? Why on earth would I need a computer to shave my face? How does a vibrating straight razor give me a better shave? Maybe I’m just ignorant since I’ve never tried one. I’m certainly not going to spend money buying a computer to shave with. Maybe they’ll send me another sample in the mail. 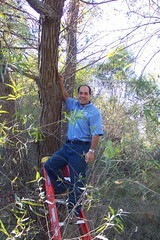 This entry was posted in Uncategorized on January 28, 2006 by Dave. I’ve fooled around with Google Adsense for a while and while it’s certainly been a great way for publishers to earn some coin, it leaves a little to be desired as far as reporting goes. Currently you can use “channels” to determine which ads are performing the best. This works fairly well, but let’s say I want to add a different channel for each blog post to determine how adsense for each article performs. The only way to do this is to manually create a new channel for each post and then maintain the adsense channel code for each post. If you already have multiple channels per type of ad (or location of the ad), you’d have to create multiple channels per blog post. This is not feasible, especially for blogs that post frequently. Here are a couple suggestions for Google to implement for Adsense. There is already an AdWords API (for advertisers), but no Adsense API (for publishers). The API should have support for managing channels and reporting. This would enable someone to create a WordPress Plugin that used the Adsense API to automatically create a new channel for each new blog post and use that channel in the Adsense code for that post. You could then track adsense performance by post without lifting a finger. With tagging all the rage of late (del.icio.us, Flickr, stocktickr), why not allow Adsense ads to be tagged? The problem with the current solution of using channels is that each ad can only contain at most one channel. Wouldn’t it be great if Google would allow publishers to add multiple tags per ad that didn’t have to be created ahead of time? Because you could add multiple tags to an ad, you could do much richer reporting in Adsense. For bloggers, you could create plugins that automatically tagged the ads in each post with a page location tag (top, left, sidebar, etc), a tag that identified the post, and a tag that identified the categories that you applied to the blog post. This wouldn’t only be useful for blogs – any data driven site that wanted to have deeper insight into their ad performance could do so far more easily that is available with the current version of Adsense. This entry was posted in Everything on January 12, 2006 by Dave. I wrote a hack for VOIP Hacks, a recently released book by Ted Wallington. Ted is a VOIP enthusiast who blogs over at Weblogs, Inc. I’ve been reading some of the other hacks in the book via Safari, O’Reilly’s online book service. From Asterisk to Skype to wiring VOIP into your home telephone system, this book has some excellent hacks for the beginning user all the way to the most advanced. If you’re into VOIP or are looking to make the plunge, consider this book. This entry was posted in Uncategorized on January 4, 2006 by Dave. It’s that time of year again. The leaves are turning, the nights are getting colder, and my wood burning stove begs to be used. There’s nothing quite like the heat that comes from a wood stove – it’s inviting, romantic, and you don’t have to pay any utility company to keep your house warm. As an endurance athlete that cares a little about my fitness, I see the benefits of chopping your own wood for a wood stove or fireplace as immeasurable. When done in regular, reasonable chunks of time, chopping wood can be an enjoyable and strengthening experience for the mind as well as the soul. It’s a cardiovascular activity that also strengthens your triceps, hands, and abdominal muscles. All this and it keeps you warm at night for free!! This entry was posted in Everything on November 2, 2005 by Dave. 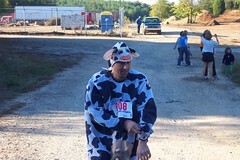 The post race festivities at the Pumpkin Run were great. Awards, music, games, and a push up contest highlighted the evening. There was hot apple cider, coffee, and, of course, pie from the seejanerun volunteers. There were very little refreshments left over at the end. The push up contest is here to stay! We had a lot of participation from both genders and I think it turned out great! We’d also like to include some sort of award if you can bring your socks from each of the four years of the Pumpkin Run. We haven’t thought of what the award might be, but if you can show us all four years worth of socks, you deserve something! 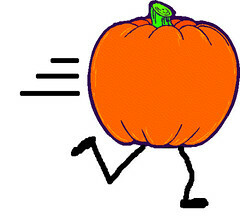 This entry was posted in Everything, Pumpkin Run on November 1, 2005 by Dave. The Pumpkin Run went off quite smoothly. There should be no surprise who won the race. John Hinton has won the race every year we’ve had it. A few more wins for John and we’ll have to rename the race after him. The women’s race was won by Joan Nesbit Mabe (her blog is here). For every year up until this one, Joan has been the race director. I took over this year and giving Joan the chance to run. We had a slight mixup in the results (due to a bandit). I’ll be posting the corrected results shortly. They’ll be posted here. It was great to see such awesome participation this year. 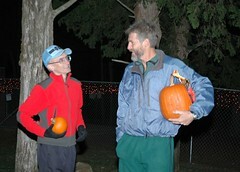 Joan and I marvelled at some kids whose time improved leaps and bounds from last year’s Pumpkin Run. The day of the Pumpkin Run got off to a cold start. We had 24 large pumpkins sitting outside our door and Joan attached the carving kits to each one and loaded them in our car. 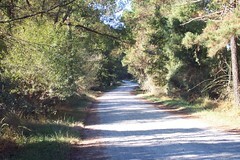 I went to the Pumpkin Run site and found a calm and serene trail – the calm before the storm, perhaps. Mike Porco brought his ladder and attached one side of the finish line banner to a tree. 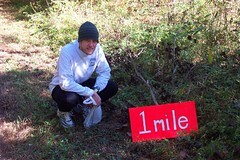 Jason Page and I carried the mile markers to the appropriate spots and marked the course with orange ribbons. We also cleared a little bit of trash from the course. The facilities folks from UNC really did an excellent job preparing the course. 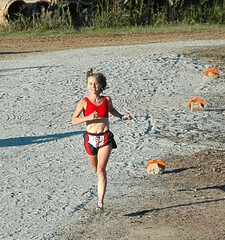 They smoothed out a very rough part of the course and put down some dirt to smooth an uneven part towards the finish. Nicole Mendes and company did a great job preparing the site at the YMCA. Seejanerun and the volunteers from the Y brought everything together for a great post race party. 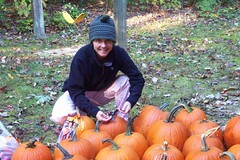 This entry was posted in Everything, Pumpkin Run on October 31, 2005 by Dave. Today is the day. There is still quite a bit of work to be done to prepare for the race: mark the course, flag the trails, raise the banner, set up the Y, and many other things. I better get going. 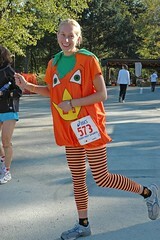 This entry was posted in Everything, Pumpkin Run on October 29, 2005 by Dave. I wrote an article on automating your coffee pot with the Misterhouse home automation program that appears in the current issue of Make Magazine. Make is a great magazine for do it yourself techies that comes out quarterly. It’s published by O’Reilly Media, the same company that published my book, BlackBerry Hacks. Here is the current issue’s table of contents. This entry was posted in Everything on October 21, 2005 by Dave.